On 07. Aug 2018 the trial against the Harmanli 21 has finally started. The encarcerated and trialled migrants are almost alone against the machinery of the state and the Fortress Europe. All actions of solidarity are of great importance now! The trial was already postponed two times. Still only 10 people were present in front of the court and were brought in and out the court building via the back door. All of them are still accommodated in the detention center of Lyubimets. The local District Court of Harmanli announced that during the trial more than 60 witnesses will be questioned. The Judge Veselin Kolarov stressed out that there is an ‚increased public interest‘ in the whole trial. 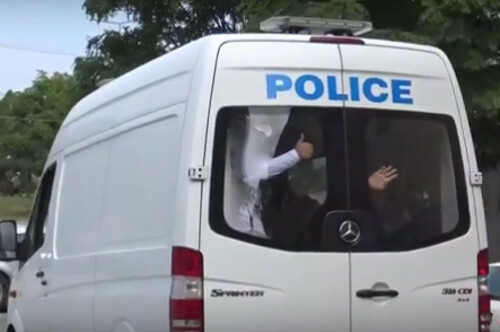 The fact that no investigation was done by the authorities concerning the police violence against the asylum seekers :: in the camp of Harmanli was criticized by Bulgarian Human Rights Organizations. Beside that, everybody of the defendants is of Afghan origin. In front of the court a group of people protested in solidarity of the accused migrants. The next court hearing will take place on the 11th of September 2018 at 9.30h. Source :: Bordermonitoring Bulgaria (02. Aug 2018). The trial has started – solidarity is more important than ever! On Aug. 7, after being postponed twice, the trial for the riot in Harmanli started. The people charged are 21, although 11 are missing and therefore those present in court were only 10. This time they were brought in through the backdoor and earlier in order to avoid meeting our group trying to express solidarity. Those who were in court today have been in detention for 2 years already without a sentence or a trial and are clearly the victims of a state and judicial system which is scapegoating them to set an example of its nationalist and racist border policies. More info on the trial and the story behind it can be found :: here. 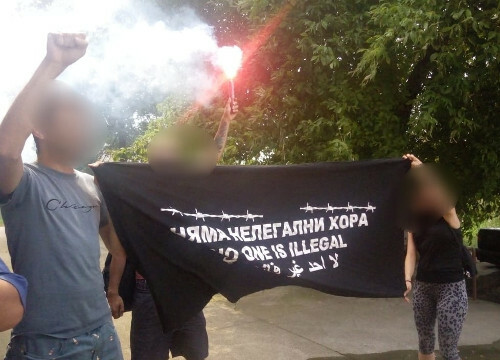 A self-organized group stood at the exit when the migrants were taken out, shouting „Freedom, Azadi, Свобода”, „No nation, no border, fight law and order”, “No one is illegal”, “Our passion for freedom is stronger than your prison”. The migrants greeted with fists in the air and victory signs before the riot van took them away. A video of the action can be seen :: here (Twitter). The next session of the trial is set for 11. September 2018, 9,30AM. The encarcerated and trialled migrants are almost alone against the machinery of the state and the Fortress Europe and every action in solidarity, in bulgaria or abroad, has an enormous meaning. After the previous court hearing, they let us know that they are aware of the solidarity actions. All actions and specifically those targeting the bulgarian state and its institutions abroad are of great importance now when the trial has started. We already heard from the court how “the trial is of a great public interest” and we have no doubt that they were referring to the solidarity shown here and abroad so far. In order to continue supporting the detained and put more pressure on the bureaucrats, we are starting a LETTER – WRITING CAMPAIGN. Let’s flood the detention centre with hundreds of letters! Write a letter in English and then translate it (with an automatic translator it is okay as well) in Farsi and Pashtu. Copy the letter 10 times for each one of the detainees and then put it in 10 different envelopes send it to each one of them separately. Talk to friends and comrades and organize even more people to do it! The more letters we send, the stronger the echo of our collective voice would be!